In a city where bigger is always better, The St. Regis Macao, Cotai Central bucks the trend and adheres to its time-honored roots of understated elegance. 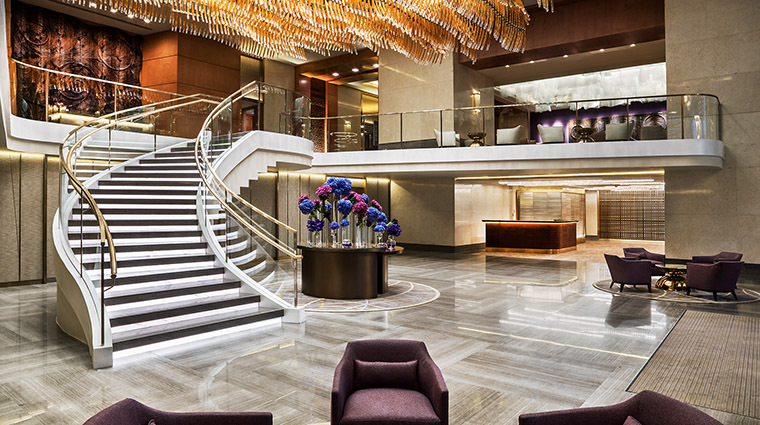 Rather than ostentatious interiors and over-the-top glitz, the sophisticated address focuses on service, stately design and top-notch culinary experiences. With just 400 rooms, The St. Regis Macao, Cotai Central could be considered a boutique property on the Cotai Strip, where most hotels are super-sized to accommodate mass tourism. 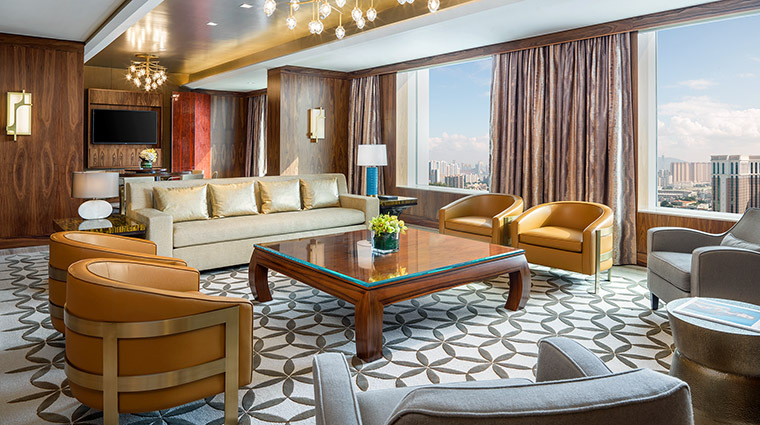 Attracting an elite clientele, the hotel takes it a notch above its neighbors thanks to its signature butler service — it’s the only Macau hotel to offer 24-hour personalized service and cater to the whims and wishes of every guest. 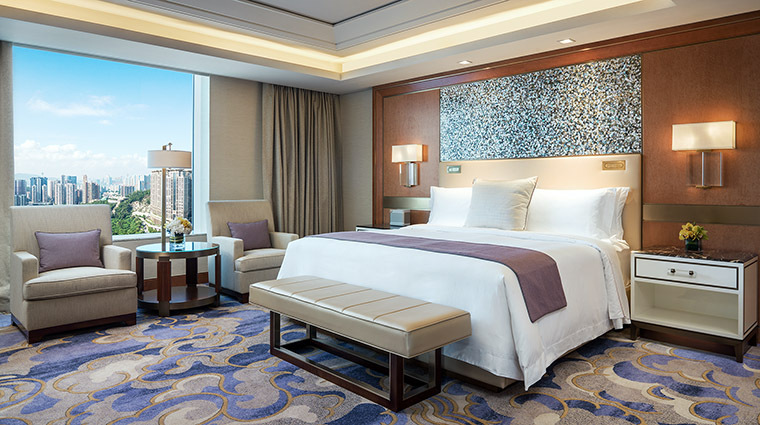 Each tastefully appointed room offers sweeping views of the Cotai Strip and are among the largest in Macau with marble bathrooms, smart room controls and extra plush beds. Enter through a grand foyer, where a gleaming bronze staircase ushers you into the reception area. Overhead hangs an amber and gold chandelier made of blown glass. Macau’s history as an important seaport is evident in the décor — from the cascading ripples in the carpets to the colorful murals and silk screens throughout the hotel. The St. Regis Macao houses two distinguished food and beverage outlets: The Manor restaurant and the eponymous St. Regis Bar. While heritage is at the core of the brand, this luxury retreat incorporates modern amenities into the mix, such as in-room touch screen controls and Illy espresso machines. The top floor of the hotel is devoted to the Iridium Spa, which may be the only spa in Macau to offer treatments with gemstones, which are said to have healing properties. No two St. Regis hotels are alike. Since its inception over a century ago in 1904, the New York-based brand has embraced the unique heritage of each destination while maintaining its prestigious identity. Ask about the tailor-made St. Regis Aficionado journeys, which offer a unique itinerary based on your passions as a traveler — be it tasting premium port and rare cognac vintages, or finding perfectly tailored garments designed by Italian brand Kiton. Starting at 571 square feet, guest rooms are exquisitely appointed with subtle yet sophisticated touches. Portugal-inspired blue and yellow carpets add a soft pop or color, while plush beds, all-marble bathrooms and walk-in closets contribute to the luxurious experience. 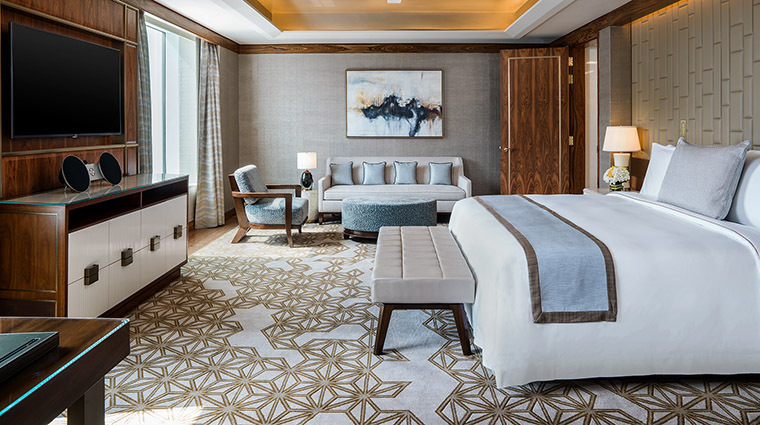 Each boasting its own personality, the suites start at 1,141 square feet with the largest being the 5,134-square-foot Presidential Suite — an opulent oasis complete with three bedrooms, a private gym, entertainment room, kitchenette, as well as an in-room spa and salon. Every guest room includes a smart tablet to control the temperature, lighting and electronics. From a beautiful breakfast spread to afternoon tea and elegant dinners, The Manor ticks all the boxes for a first-rate dining experience. Designed to feel like a palatial abode, each of the five dining rooms offers a different vibe — from the light-filled Verandah to the intimate Wine Gallery. In the evening, don’t miss the selection of carnivorous treats at The Manor. The menu includes Miyazaki wagyu from Japan, highly coveted Culatello di Zibello from Italy and beautifully marbled black angus beef from Australia. Craftsmanship abounds at the St. Regis Bar, which is known as one of the best in Macau. 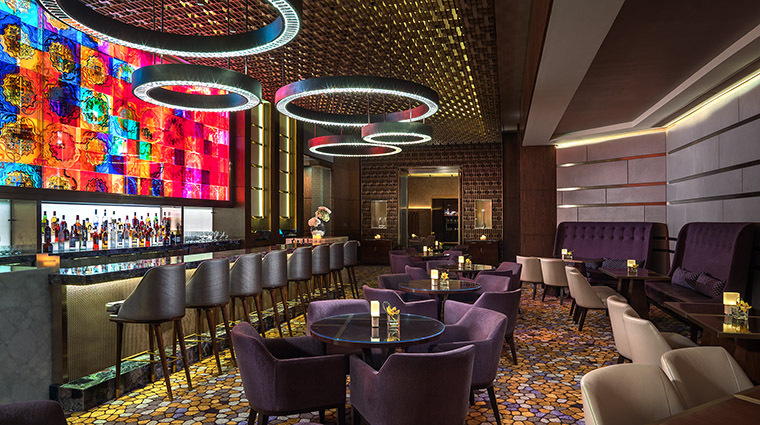 Admire the artwork — like the two-tone Harmony Chinese and Portuguese-inspired LED screen mural above the bar — while sipping on a hand-crafted cocktail or a glass of port. Don’t leave without trying the signature Blood Mary, dubbed the “Maria do Leste (Mary of the East),” which comes chock-full of Portuguese ingredients and is accompanied by a creamy, flaky egg tart. If you fly into HKG, you must cross the bay by ferry to reach Macau.